I own a summer residence on the Navesink Highlands in the rear of the “Twin Lights”. Recently a revolving electric flash light has been put in one of the light-house towers. Its spasmodic flash strikes my house at constant intervals, and the ladies of my home are made nervous and irritated by the ever repeating flash. There is no occasion for this nuisance, as any light rays outside of an arc of 190 degrees inclusive of the ocean front is of no value to vessels, and the remaining arc of the circle facing the land, can be screened without great expense. I should be grateful if you would give this matter your personal consideration, as not alone of my home, but a large number of valuable summer homes are depreciated in value by what is universally considered by these property owners, as an insufferable nuisance. Then we ate at Bahr’s Landing. This entry was posted in Random on 29 November 2010 by rand. There was a moment in time. Just a brief, fleeting moment, when love was in the air on Sixth Street in Hoboken. In a small ventilation inset of the Burchard Building – a Stevens Institute of Technology classroom and laboratory building marked “Electrical Engineering. Metallurgy – Physics” – liquid refreshment containers reproduced. It was signed the Love Nest. The progenitor was a small Rita’s cup. 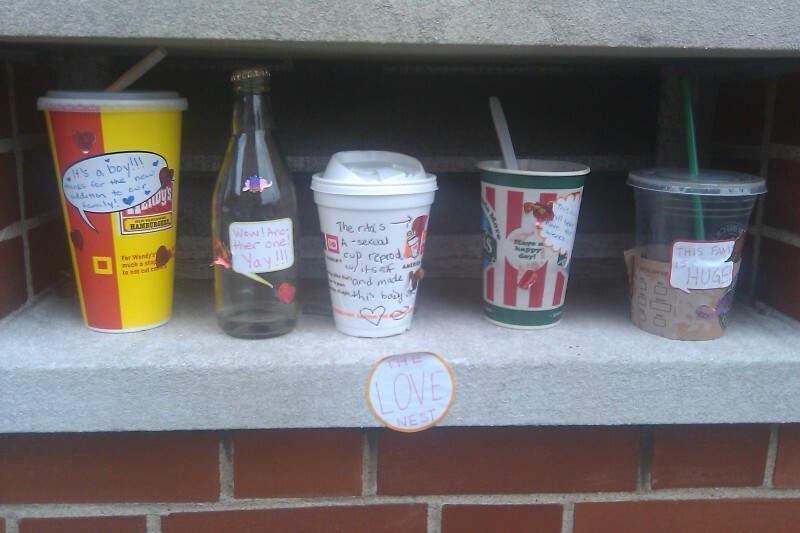 Left on the ledge for “weeks”, this delightful cup asexually reproduced a Dunkin Donuts cup. The next day, in an explosion of Pre-Cambrian proportions, a glass bottle, a Wendy’s cup and a Starbucks cup were all produced. Then, in no quicker a time than it appeared, the Love Nest went extinct. I miss the Love Nest. Do you? This entry was posted in Hoboken on 13 November 2010 by rand.